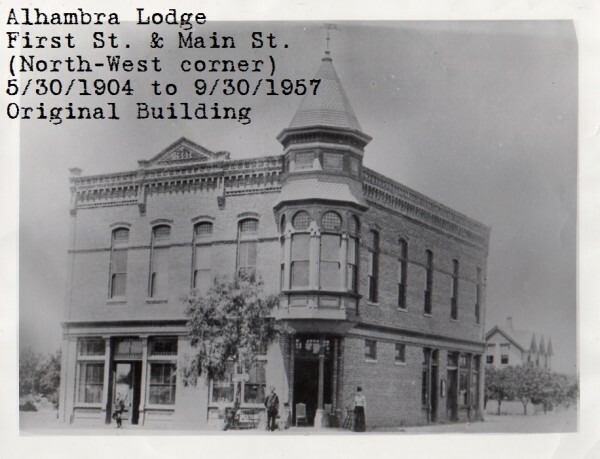 The first preliminary meeting for the organization of the lodge was held in the parlor of the Alhambra hotel on Saturday evening, June 9 1894, with 22 Master Masons attending. Their memberships were scattered in various parts of the United States. Brother Past Master James M. Reamer Officiated as Chairman of the meeting, with Brother Norval G. Felker acting as Secretary. After several other meetings, 12 of the 22 Master Masons petitioned the Grand Lodge for a dispensation authorizing them to organize a Masonic Lodge in Alhambra. on September 1, 1894, Grand Master Henry S. Orme granted them a dispensation to organize a Masonic lodge in the town of Alhambra after a recommendation had been made by Pasadena lodge #272 F. & A. M., then the only other Lodge in the District. The 12 Master Masons who became Charter Members were the only Masons present who could obtain permits as their Home Lodges were not closed for the summer. The Lodge met in the Old Messenger Hall in the 100 block on S. Garfield Ave. The Lodge sublet the hall from Alhambra Lodge no. 27 Knights of Pythias, who had a lease on the building, rent being $8.00 a month. The Inspector certified to Grand Lodge that Messenger Hall was a safe, suitable Lodge room for Masonry. New members were coming into the Lodge and the Lodge was steadily growing until about the year 1904, when Brother Sherman A. Bullis was elected and installed its Worshipful Master. Then things commenced to move. The property on the NW corner of 1st & Main was offered to the lodge for $4,500.00. There was a Lodge Hall on the second floor and stores on the first floor. The more conservative members were afraid to go into debt, but Brother Bullis was more enthusiastic, purchased the property himself, and later sold it to Alhambra Lodge for the same price he paid for it. A Masonic Lodge could not go in debt, so the first Alhambra Masonic Temple Association was formed on April 2, 1904, which was a corporation organized under the laws of the State of California to handle the finances of the building. The building at 105 W. Main St. was dedicated on may 30 1904. Up to may 26 1915, Alhambra lodge had jurisdiction over all this territory half way to El Monte, California, but on this date the Worshipful Grand Master granted permission to certain brethren to form a new lodge in Monterey Park, gave them jurisdiction up to Valley Blvd. in Alhambra, thus taking part of our territory and members. Then on December 23 1922, the Grand Master again cut off part of our territory and members when he granted a dispensation to certain brethren to form Granada lodge no. 608 in the city of Alhambra, within one block of Alhambra Lodge. In about the year 1950, there was much discussion and concern about older members being unable to climb the stairs to the lodge room. the first plan was to install an elevator but was not recommended by constructural engineers. This started the idea of building a new Temple. It was discovered that one of our members, Brother Albert C. Wheat, owned 4 lots together between 1st & 2nd streets about a block south of Main St., that he would sell to the lodge for $36,000.00. in July, 1953, the property was purchased. Architects were engaged to design the building. Groundbreaking ceremonies were held September 24 1955, which was followed by a dinner prepared by the Triangle Club. A contract was awarded to construct the foundation, brick supporting walls and timber roof which was completed March 1956. On November 11 1955, at 1:00 PM, Grand Master Edgar V. Stewart and his officers laid the cornerstone of the new building, after convening Lodge in the old Temple. About the time the trenches were dug for the foundation, the cement industry went on strike and in order to obtain cement we had to pay five times the regular price. The strike lasted until after the building was completed, so the terrazzo floor was put in with regular cement. When the contract was finished our operative masons of Alhambra lodge started to work, nights and weekends, until the building was completed. 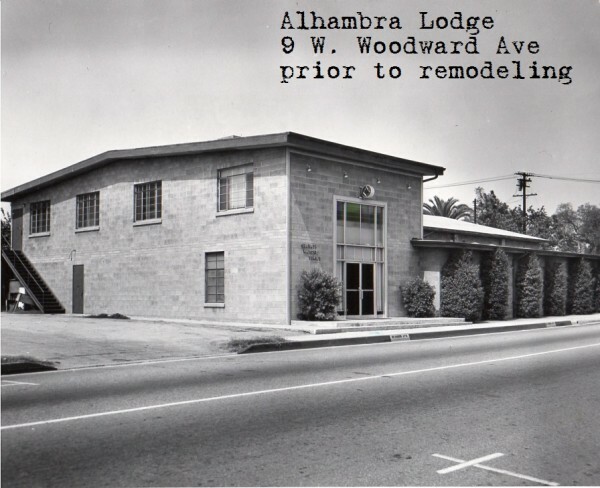 The new Alhambra Masonic temple was dedicated April 14, 1958, by Grand Master Leo W. Anderson and his Officers. Through the years the members have enjoyed many dinners, dances, breakfasts, bean & burgers, along with their wonderful fellowship in the Lodge. On December 1, 1986 Progressive Lodge no. 578 consolidated with Alhambra Lodge and the name of the Lodge became Alhambra Progressive Lodge no. 322. The City of Alhambra had tried for many years to obtain our temple property without success. They finally accomplished their goal and in July 1992, the Blue Lodge, York Rite Bodies, and Eastern Star all moved to Granada temple 9 West Woodward Ave Alhambra, on a rental basis. 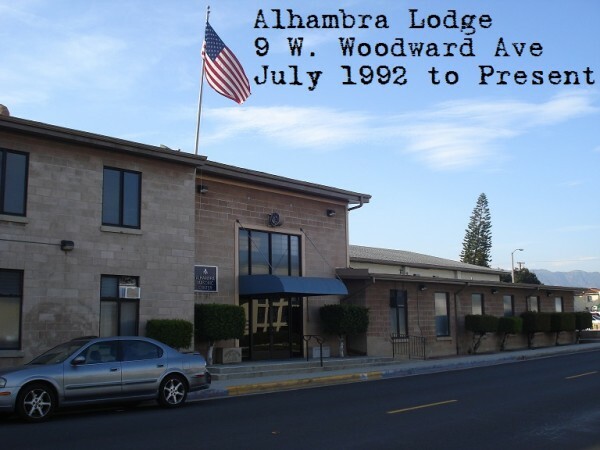 On January 1, 1993 Alhambra Progressive Lodge no. 322 and Granada Lodge no. 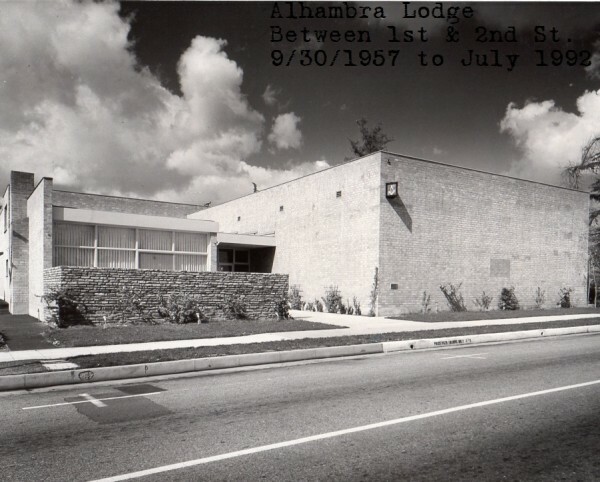 535 consolidated and the name again became Alhambra Lodge no. 322. There were a lot of sad feelings and misty eyes when we had to give up our Temple because a lot of Lodge members had put their labors into helping build it. A beautiful much needed new Alhambra Police Station stands in its place. As for our new home at Granada Masonic Temple – it is now much our home. Repairs, painting, remodeling are going on all the time. All the seats and furniture from the Alhambra Temple Lodge Room were placed in Granada Temple Lodge Room. The carpet and walls from Granada lodge and the furnishings from Alhambra lodge blend together perfectly, and that is just the way the consolidation of the lodges has been.